Have a case of Wanderlust, but hate spending the big bucks on last minute flights? Here's your chance to save major dollars, and take in a few sites around this gorgeous country! 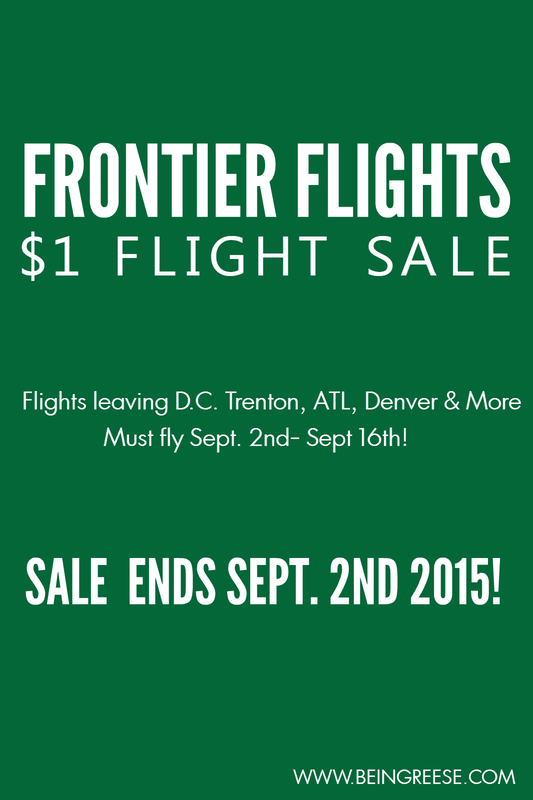 For today only, Frontier Airlines is running a massive special. They are offering $1 flights leaving Atlanta, Chicago, Cleveland, Denver, Philadelphia, Washington, D.C. and Trenton. If you live in or nearby one of these cities, now is the prime time to book a flight! However, as with most things that sound a bit too good to be true, you've got to be a bit savvy to outwit all those pesky fees. All flights must be booked by tonight and you only have a two week window to travel (Sept 2nd.-Sept. 16th). Then there's baggage. Hidden baggage fees can actually cost more than the flight itself. Take my advice and pack light. Even a carry-on can cost up to $30 both ways. If you're only going for an over-nighter, ditch the suitcase and carry a small backpack instead. Frontier Flights allows you to carry one small bag on the plane free of charge. "We know how important your headphones, laptops, and crossword puzzles are for your in-flight experience. All passengers are allowed one free personal item that will fit under the seat in front of you. It can be no larger than 14” tall, 8” wide, and 18” long (including handles, wheels, and straps). Think backpacks, purses, briefcases and computer bags." (Check out their baggage page for more information on what qualifies as a carry on). Finally, beware of the extra options. For instance, personally picking your seat, instead of having one automatically assigned to you will run you an additional $15 both ways. Travel insurance can tack on another $20. Basically, the name of this game is keep it simple. Frontier is offering a pretty sweet deal, as long as your willing to travel bare-bones at the last minute. Sure the accommodations might not be what your accustomed to, but can you really turn down a $1 flight to a city you've always wanted to visit? Remember, this deal ends TONIGHT at midnight! Grab your tickets before they're gone!